I adore the orange cabinets, the 50% horizontal glazing, and the lovely, lovely, lovely wooden beams (vertical and horizontal) alike. And as a papa of a young kiddo myself, the ground space is built for play/exploration/tumbling/soft napping. Now, as to the other elements, I can’t say enough about the committed focus to guarantee the students’ ability to maintain/develop “independence” and “freedom”. The navigational wall rail, the cork board (sensitive/comfy to the touch), and the ‘risky’ choice of curved walls that seems to defy the ‘logic’ of traditional views of ‘helping’ disabled humans get from point A to B. But when ‘discovery’ and ‘trust’ are coupled…anything is possible! Oh, how do I respect the approach this team took! I am taken by the amount of time spent with users, client, staff as well as experts. A great deal of thought – four years – went into this design result. 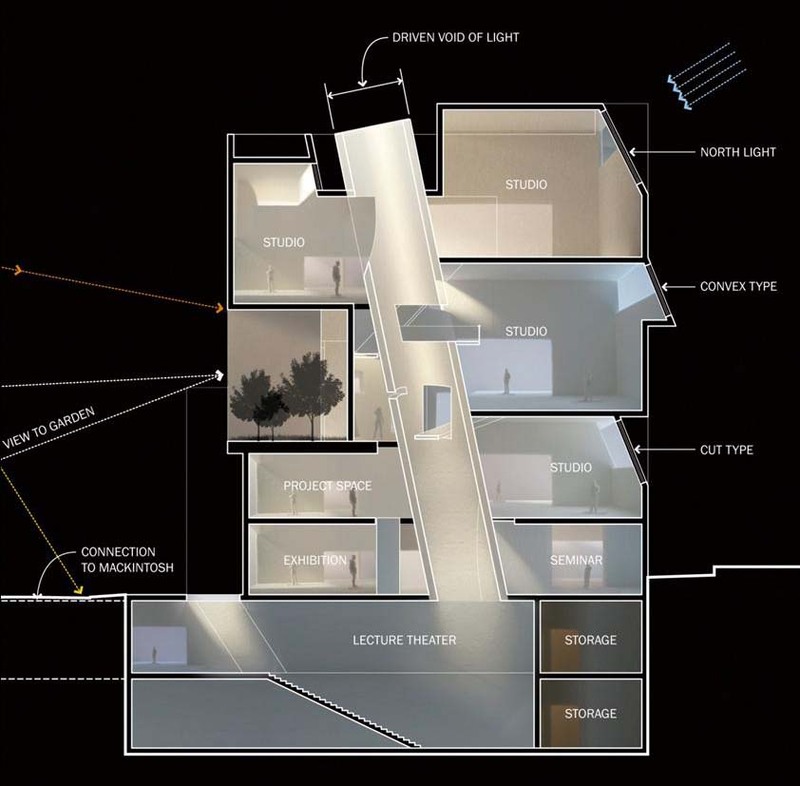 The attention to multi-sensory detail, the integration of the building with its site, and the focus on way finding is quite interesting – although I confess I do not know enough to be a judge of its success. I sense that much was learned by all in this process. I hope they publish a lengthier book detailing what they learned. A beautiful, well thought-out design. Every school should be like this. It sits well in the site making most of existing trees. Use of natural materials and variety of materials give it a very ‘soft’ edge. Internal spaces have excellent daylight and louvers create stimulating patterns. Space planning is also a very good with wide corridors and storage spaces outside each classroom for mobility aids etc. There is also access to outside from each classroom. Whole briefing process is also innovative. Not many schools would appoint a head two years in advance. Four months consultation process also seems to have helped in refining the brief. An excellent facility for some of the most needy children. I will go all the way to Honor Award on this one. Great feeling, good energy. This school captures the tight site mentality without becoming boxy and institutional. 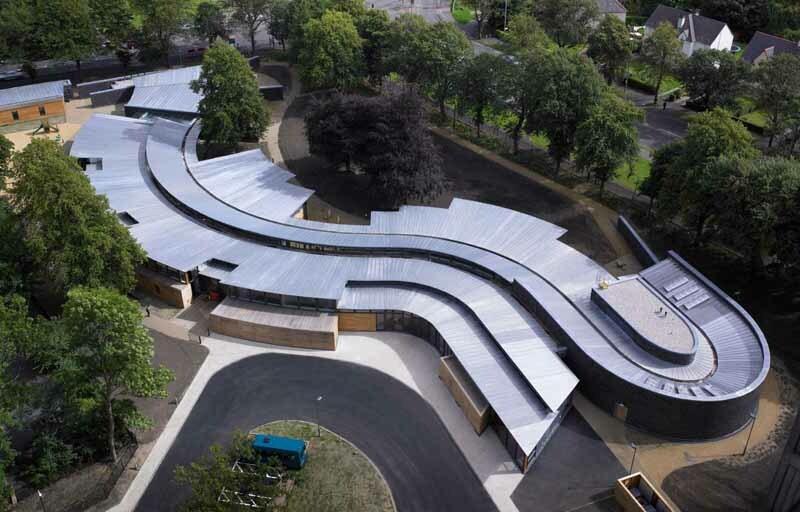 Hazelwood School for the Multiple Sensory Impaired by Gordon Murray + Alan Dunlop Architects has become the first school in Britain to win a DesignShare Honor Award. The DesignShare Awards programme, based in the USA, is the world’s most widely recognised programme focusing on the design of innovative learning environments. The Honor Award is the highest category in this annual international awards programme. Hazelwood School caters for 60 students with multiple disabilities, aged from two to 19. Each student has a combination of two or more of the following impairments: visual impairment, hearing impairment, mobility or cognitive impairment. The design focused on creating a safe, stimulating environment for pupils and staff. Gordon Murray + Alan Dunlop Architects set out to eliminate any institutional feel and worked to avoid conventional/standard details, creating a bespoke design that incorporates visual, sound and tactile clues. 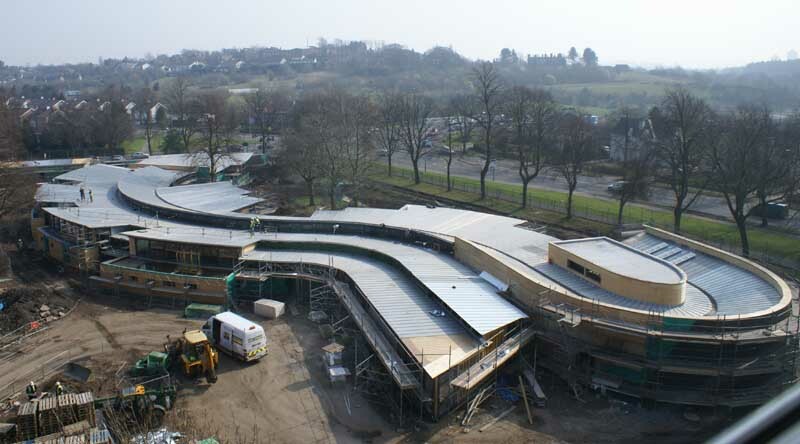 The School has also been nominated for a World Festival of Architecture Award. Hazelwood, Glasgow’s new school for children with duel sensory impairment, has won a prestigious Civic Trust Award. Hazelwood fosters life skills in children with severe learning difficulties, to help them lead independent lives. The children, who age between 2 and 18, are blind and deaf or have a variety of sight problems. Others have cognitive impairment and physical disability. Hazelwood, Glasgow’s new school for children with duel sensory impairment, has been shortlisted by the Royal Incorporation of Architects in Scotland for the Andrew Doolan Award. 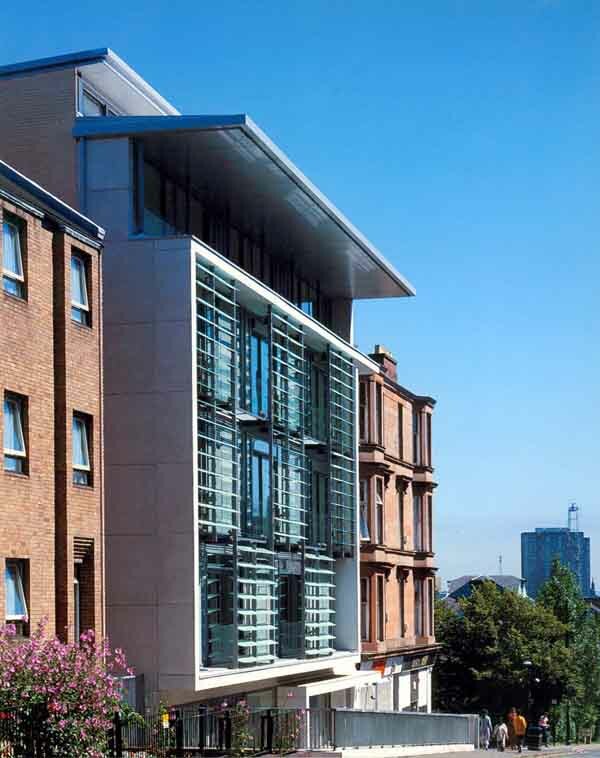 The award is for the Best Building in Scotland in 2007 and is the biggest in the UK. The school is located in a quiet residential area on the edge of Bellahouston Park and the Dumbreck Conservation Area. The building is conceived in natural free flowing form and meanders through the site respecting it’s existing landscape of mature lime and beech trees. Timber is the predominant structural and cladding material was selected for its natural weathering qualities and its character and warmth. The architects have developed innovative sensory clues throughout their design to help the children orient themselves within the school environment and find their own way to their classrooms. For gm+ad it is a successful conclusion to an intense four year design, consultation and construction process, involving Glasgow City Council, parents, teachers, clinicians and the children themselves. Keir Bloomer, former Chief Executive of Clackmannanshire Council, Chairman of the Tapestry Group and renown educationalist, says Hazelwood School. “if anything, exceeds expectations. There is really so much to admire about it; the way the design is adapted to the site, the choice of materials, the linking of interiors to the exterior and much more. For me the the complexity and avoidance of straight lines ensure constant interest and variety while still maintaining intimacy and human scale. I shall certainly keep on saying to anyone who will listen that it is the most exciting new school building in Scotland”. It is the fourth time in the five years that architects Gordon Murray and Alan Dunlop have been shortlisted for the £25,000 Andrew Doolan Award. “Following significant consultation with parents, staff and related professional bodies, Glasgow City Council has invested in a unique school for children with additional support needs related to complex and dual sensory impairment. 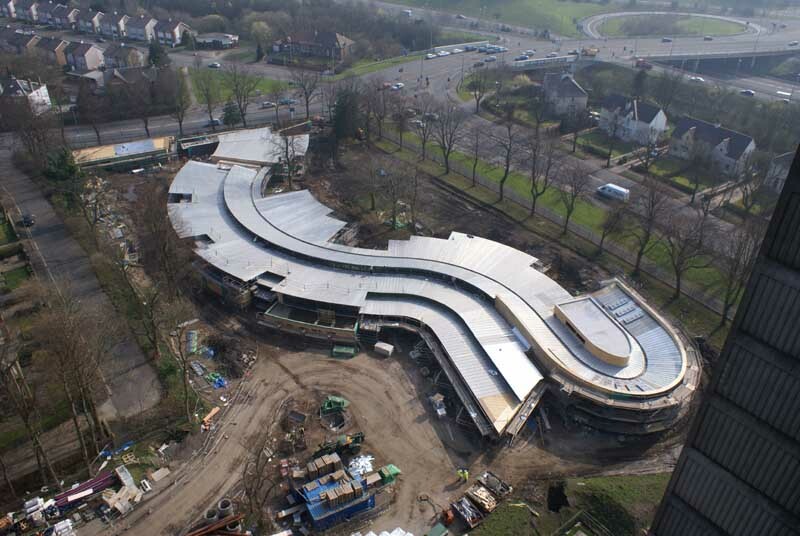 The new Hazelwood school will be situated in the Dumbreck area of the city within the vicinity of Bellahouston Park and will provide custom built facilities for the children and young people who currently attend Kelvin and Carnbooth schools. The successful contractor is Sir Robert McAlpine. Alan will present the campus design to architects, teachers, academics, voluntary organisations and other professionals at the major international conference “Making Space:Architecture and Design for Young Children” at the Lighthouse, Scotland.